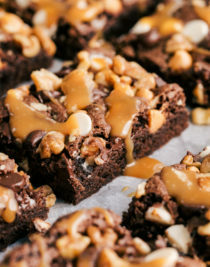 Looking for melted gooey cheese and a powerhouse of flavor in every bite? These Cheesy Skillet Meatballs will be perfect served hot and cheesy right out of the skillet around your table tonight. 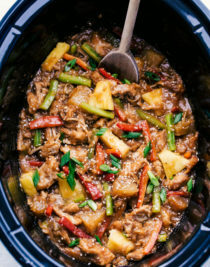 One pot recipes are perfect when feeding a group of family and friends. 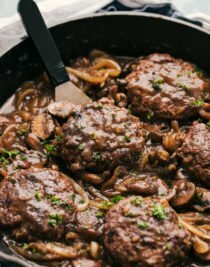 A few family favorites that I think you may also love is this Hamburger Steak meal filled with hearty beef patty’s and a creamy mushroom sauce. Or this super simple and delicious Cast Iron Skillet Pizza that can be made in a variety of ways. If you are looking for a gooey and sensational family dessert you have to try this Pumpkin Cobbler recipe all you need are a few spoons to dive right in. 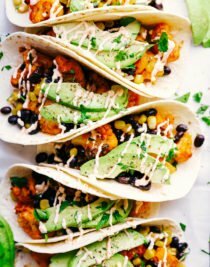 Are you looking to make dinner a fun family night where you can all just gather around the table and enjoy each others company and eat? 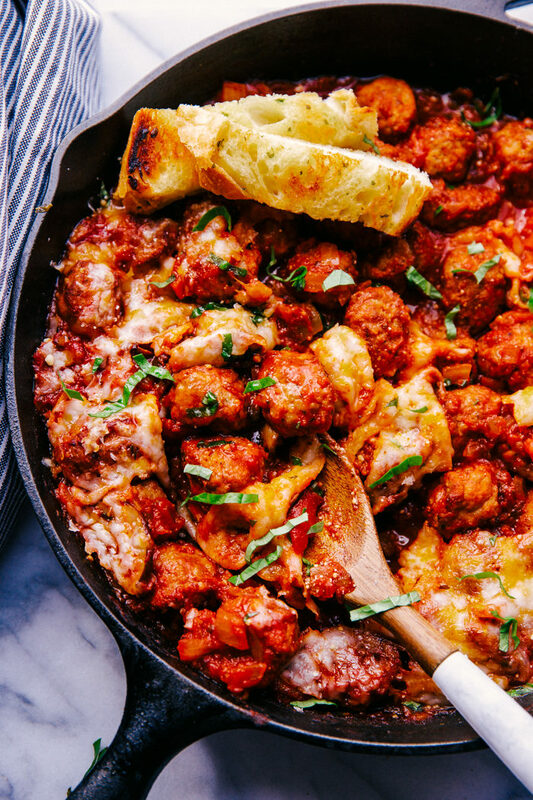 These Cheesy Skillet Meatballs will be just the recipe you need to have a fun family feast. 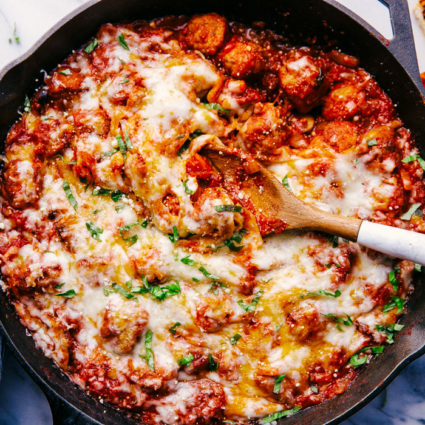 Full of two kinds of cheese, deliciously flavored marinara sauce, and loaded with the best tasting homemade meatballs around, serve with garlic bread and a caesar salad and these skillet meatballs will win your whole family over. 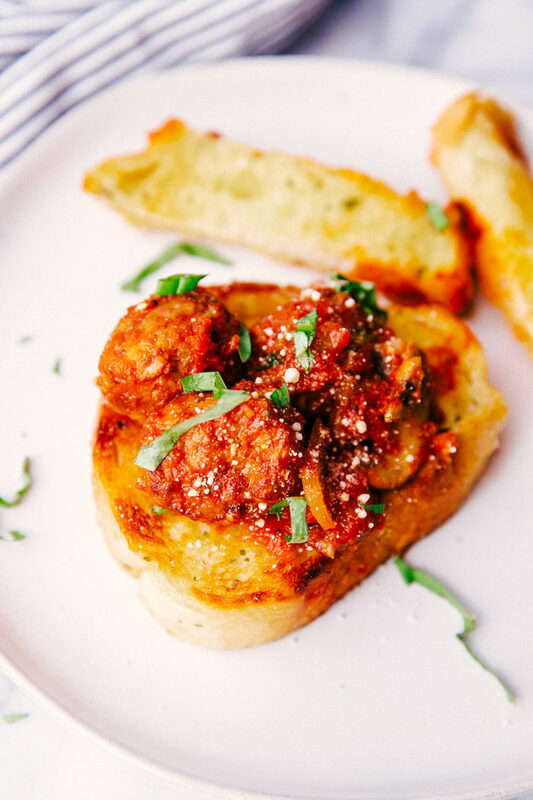 If you really want to kick it up a notch, try adding this Cheesy Parmesan Chicken Garlic Bread along with these skillet meatballs. 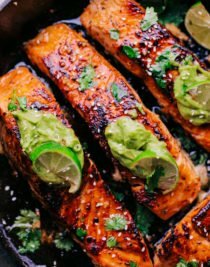 One pot meals make life at dinner time so much easier. 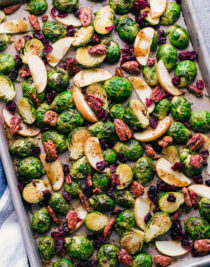 Who wants to dirty a million pot and pans and try and cook more than one thing in the oven (especially if you only have one oven) on a busy week night? Not me! 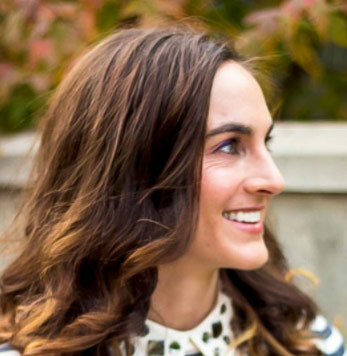 I love simplicity and making life as less of a hassle and more of an enjoyment. 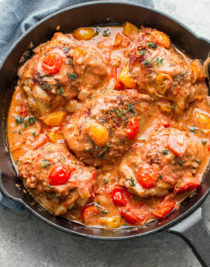 That is why these meatballs in marinara sauce cooked in one cast iron skillet is perfect for making life simple and a little more hassle free. How do you cook fresh meatballs? Preheat oven to 400 degrees. Either spray a rimmed baking sheet with nonstick cooking spray or line it with parchment paper and set aside. Mix all ingredients in a large bowl, making sure everything is combined. Shape into 1-1/2 inch meatballs and place on prepared baking sheet. They can be placed close together, but not touching. Bake in the oven for 20 minutes uncovered, making sure they are no longer pink. Cooking meatballs in a skillet is another option compared to cooking them in the oven. For these easy skillet meatballs I choose to cook them on the stovetop. How do you pan fry meatballs? In a large bowl add all your meatball ingredients and mix to combine. I like to use my clean hands to make sure everything is incorporated. Form into large or small sized balls, the size is all up to you. Using a large skillet heat 2 tablespoons of oil over medium heat. Add the meatballs and fry making sure to turn the meatballs often to brown on all side, about 15 minutes. Remove the pan fried meatballs from the skillet and set aside until ready to use. How do you make meatballs in sauce? In a large bowl combine all your ingredients for meatballs and form into balls. Pan fry in skillet over medium heat for 15 minutes until brown on all sides. Remove and set aside. In same skillet over medium heat add onions and mushrooms and sauté 3 minutes, until tender. Add in marinara sauce, minced garlic, garlic salt, pepper and a pinch of sugar. Mix to combine and heated through. Carefully add cooked meatballs back to skillet and stir to cover meatballs in sauce. Top with mozzarella and cheddar cheese. Set oven to high broil and broil for 3 minutes until cheese is melted and bubbling. Garnish with parmesan cheese and fresh basil. One of my favorite things about these homemade meatballs is that instead of using regular bread crumbs I ground up seasoned stove stop stuffing mix. Stuffing mix has so much flavor in it already it really makes this these skillet meatballs bold and rich with flavor. 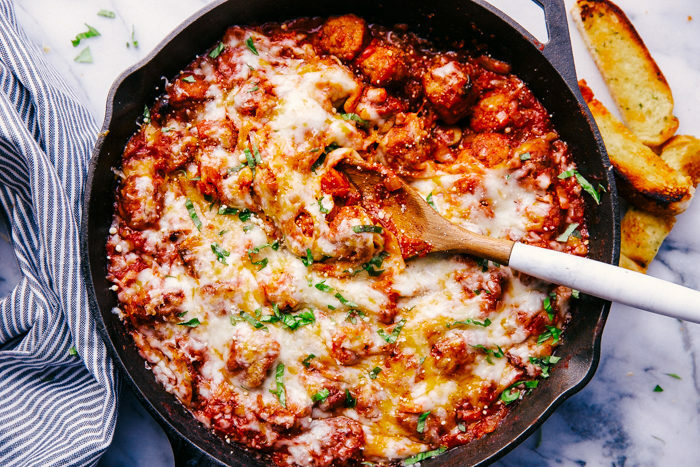 Serve these Cheesy Skillet Meatballs with a side of garlic bread or french bread and dive right into all the cheesy goodness that comes in one easy skillet meal. 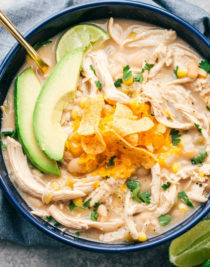 Are you in need of more one pot recipe ideas? Or use 1lb pre cooked Italian meatballs thawed. In a large bowl combine all ingredients for meatballs and mix to combine. Form into balls. In a large skillet over medium heat add 2 tablespoons oil and fry meatballs turning often for 15 minutes. Remove meatballs from skillet and set aside. (If using pre-cooked meatballs, fry about 5 minutes until browned). For homemade meatballs CLICK HERE and omit the cranberry and chili sauce for this recipe.